A happy Chuck Atkins, Sheriff Elect for Clark County Washington, thanks supporters and well wishers as he learns he holds a significant lead over opponent, Shane Gardner. Lead-in by Maria Rodriguez Salazar. 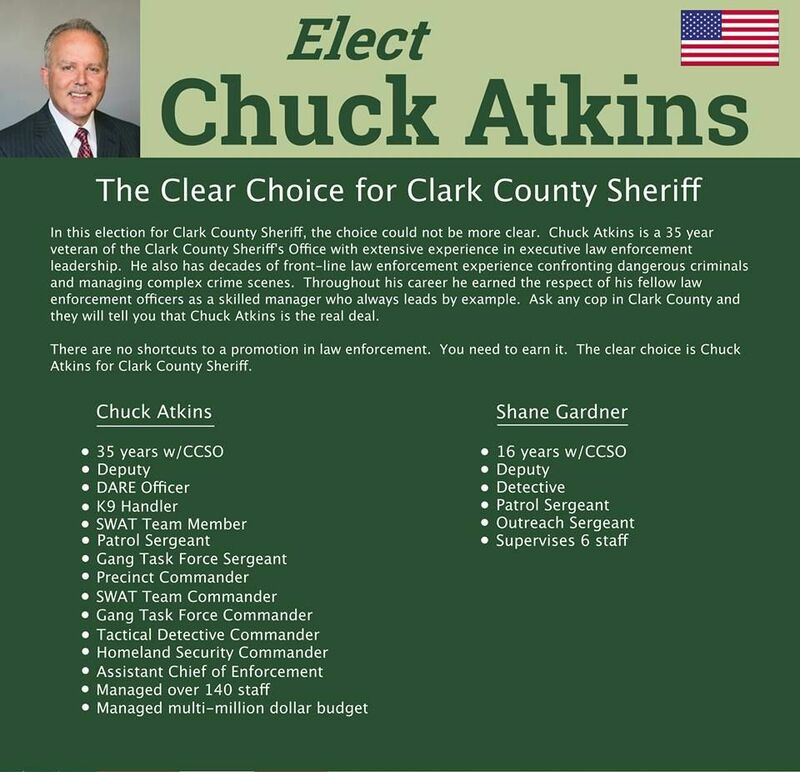 Congratulations to Sheriff Elect Chuck Atkins and many thanks to his opponent, Shane Gardner for a good campaign. 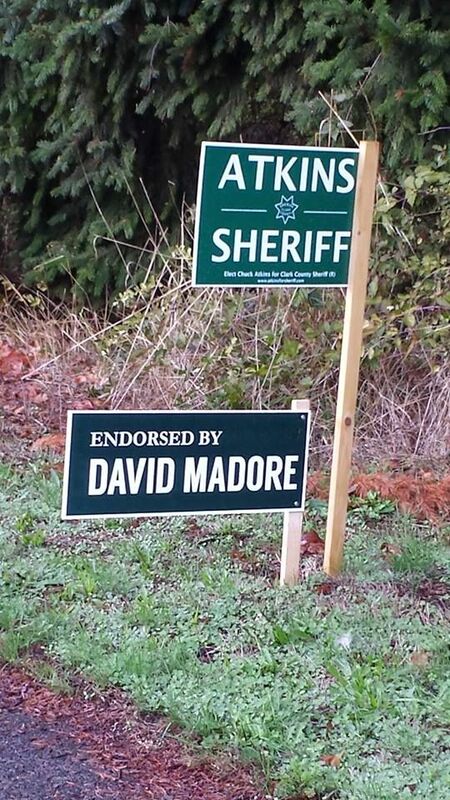 Is the Shane Train really so desperate that one of Gardner’s supporters ordered up a bunch of these signs then sets them up around town at Atkins signs and sets up a phony David Madore’s Friends page?? Do you want a Sheriff that is silent over such dirty, underhanded tactics from his supporters? If he allows such dirty behavior now, how much dirty behavior will he ignore as Sheriff? Atkins is also endorsed by Mayor Tim Leavitt, former Mayor Royce Pollard, and Tony Golik. It is said that the signs were purchased by a young Democrat named Pond that also set up the phony facebook page, David Madore’s Friends. UPDATE: I am now informed that Pond has been placing these signs at other Republican candidates signs as well as Vote No on the Charter signs. Got back home yesterday afternoon and still tired, exhausted would be more accurate. Enjoyed being in San Antonio and elsewhere, but as was said in the movie, there’s no place like home. I did spend two days in Peidras Negras Mexico and surprisingly, witnessed no problems at this particular border crossing. That doesn’t mean other locations do not experience them, but for whatever reason, this particular one is not. It’s good being back home and now, as I rest up, will get back up to s peed on the primary elections. I listed just a few at the top of the sidebar to the right of those I support and will be looking closer into adding more. 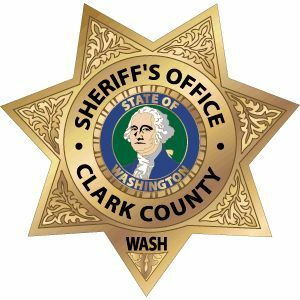 Sheriff’s Candidate forum for Clark County Washington Sheriff, May 22, 2014. This event was hosted by the National Women’s Coalition Against Violence & Exploitation and UniteWomen.org at the YWCA Clark County Community Room in Vancouver, Washington. Candidates: Ed Owens, John Graser, Shane Gardner and Chuck Atkins. The event was moderated by KGW TV anchor Wayne Havrelly. To what we owe this announced visit from the Westboro cretins, I don’t know. But they have announced their plans to be here to stage one of their hate-mongering protests outside of Heritage High School on June 1, approximately 2:15 PM to 2:45 PM. They may call themselves a “church” and “Baptists,” but they are anything but. They have no known affiliation with any Baptist Association or Convention. Calling themselves “Independent Baptist,” following Primitive Baptist and Calvinist principles, not one mainstream Primitive Baptist group agrees with them, all rejecting their perversion of scripture. This small band of followers of Fred Phelps, comprised mostly of his family members, is no doubt the most hateful cult I can recall. From his initial “God Hates Fags” to spread hate to Gays to his protesting at funerals of our fallen Troops, there is not an ounce of biblical love coming from these cold hearted hate mongers. Besides dishonoring others in the community across America, they seem to desire to provoke angry responses so they can file lawsuits against people, some family members being attorneys. As much as they pervert scripture to justify their hate, they pervert laws to protect their hate, as was seen when Albert Snyder, whose son, Lance Cpl. Matthew Snyder, was killed in action in Iraq in 2006 was ordered to pay the hate group’s legal fees for an appeal they filed to reverse a multi-million dollar award stemming from their protesting outside Matthews funeral. I’ll reserve comment on the judge. May 28, the group plans to picket five Jewish synagogues and centers; a Catholic church; a Bible church; and the large New Hope Community Church near Clackamas, Ore. Early June 1, the group will picket Portland’s Grant High School before the first bell, the website shows. If it were up to me, their “safe environment” would be supplied next to the sewage treatment facility down by the river. It is unknown to me if there will be any organized opposition to their protest. Patriot Guard Riders, who have long placed themselves between the hate-group and families at funerals, must be invited by a family member or an official. Such despicable hate as this group spreads must be stood up to somewhere in our legal system. They target not only Gays and funerals of our fallen Heroes, but Jews, Catholics and just about everybody outside of their hate filled group. They too will one day stand before their maker and be judged for their actions. The country must stop cowering from these hateful people, for as much as other hate-groups were largely marginalized for their hateful actions during the Civil Rights era; whatever legal measures are available must be taken to drown out this message of hate today.